Sesame Wide apartment – modern gem in the center! Sesame Wide apartment is a comfy studio flat in the city center. 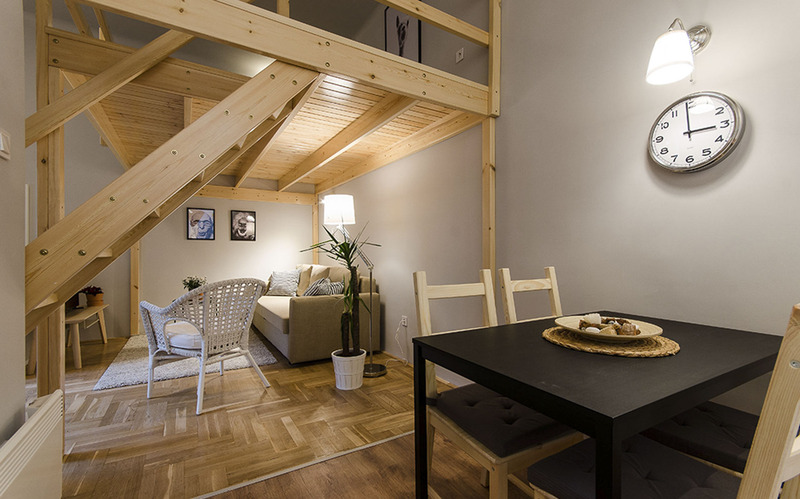 It is well equipped, comfortable for up to 4 people, an ideal base to experience all that Budapest has to offer. The apartment is in a neighborhood of quiet streets, surrounded by busy city avenues. In 5 minutes walking you can find nice cafés, restaurants, some famous clubs, museums, supermarkets, the biggest shopping centre of Budapest, and also parks, playgrounds and a small market. Sesame Wide apartment has the perfect location for sightseeing and nightlife too. It is close to the river, so in 10 minutes walking you can enjoy one of the most beautiful views in Budapest. The closest sights are the Parliament, the Opera and St Stephens Basilica, 5-10 minutes walking away. This home is close to one of the most important public transport junctions of Budapest. The closest metro station is Nyugati pályaudvar (line M3, a few minutes away), and the 24 hours running trams 4 and 6 are just a few minutes away too, so you can easily get to anywhere in the city any time of the day. It is also great to bike around town, there is a bike road on the big avenue close to the apartment towards the main square, and in the neighborhood it is great to bike on the quiet streets. At check-in I’ll be happy to show you some good places to rent a bike. The next door apartment is also for rent, please check Sesame Light Apartment in my listings. The two Sesame apartments can be comfy for bigger families or bunch of friends.